The site I found it on was called Banggood.com which means something like “best bang for your buck” so I’m thinking it must be some Chinese retailer perhaps? Anyway here’s the link I used and I’ll try to put up a post after I receive them and give them a try. I finally got around to shooting a quick video on the basics of custom fitting one of the mouthpieces that I ordered off of Amazon. Since I’ve ordered my last pair of mouthpieces, I’ve seen even cheaper alternatives available on Ebay as well. 4. It’s ok if I need to re-heat and reset and push against the mouthpiece to better mold to my gums and teeth! Let me know what you think and if you have any other helpful suggestions to pass along! One option that I had not considered when I was trying to solve my snoring issue was the possibility of entering into a clinical trial for snoring. I have since found out that there are quite a number of sleep studies that have clinical trials focused around sleep apnea and even some specifically for the treatment of snoring. Often, these clinical trials do not charge the participant for the devices, medication and or therapies employed. Clinical trials may be a less costly alternative to the regular sleep study that I went through and had to pay dearly for. You may, in fact, even be paid some form of compensation for your participation in the trial. Of course with clinical trials, there may also be some risk involved. Also, keep in mind there is no guaranteed outcome as whatever method or treatment they are trying is in a “trial” period. It is recommended that you first work with your primary care physician to see if a clinical trial may be a good fit for you before deciding to undertake one. In the U.S. and many other countries there is much emphasis put into ensuring the safety and well-being of the participants and that the clinical trial follows a predetermined protocol. Many trials follow the ICH GCP’s protocols to protect the participants. Many clinical trials involved in pharmaceuticals may make use of placebos, so there is a possibility that you may not in actuality be receiving the actual treatment. I ran across this article today written by a fellow named Andrew Senske which discussed the need for a prescription in order to use and purchase CPAP equipment and how the current system is most likely preventing people from actually getting the help they need. It also goes on to describe how it is creating much higher healthcare costs (not to mention taxes) for supporting Medicare’s role for mandating 13 month CPAP rentals at ridiculously high prices. I am very thankful that the mouthpiece remedy has worked so well for me rather than have to deal with all the extra visits to the doctor, prescriptions and dealing with the “durable medical goods” companies. I hadn’t actually heard the term before until the sleep doctor that I visited mentioned it and recommended one. As my insurance covered only a small portion of my sleep study, I am very aware of the amount being charged. I really am not surprised by how costs for these devices and studies are inflated when people are forced to jump through a bunch of governmental hoops. I did receive the UV-Ozone Nature Zone mouthpiece disinfector in the mail and have been using it. It seems to work pretty well with a few drawbacks. First I’ll explain the good things I like about it though. For starters, it only takes 3 AAA batteries and they don’t seem to ever die. I’ve only changed them out once and just because I felt like it – – not because they had actually died. The second thing is that there is no complicated settings to deal with… just one button! Of course the best thing about the device is that it REALLY DOES take away some of the funky smell that may be hanging around on the mouthpiece. I still always do a good job rinsing and cleaning, but I feel much better knowing that any stray bacteria has been eliminated. Now for the things that I don’t necessarily like about it. The first was the cost. I am not sure the ~$50 price tag should be that high for the device, but I really didn’t find anyone else making that sort of thing, so I supposed they can ask whatever they want. The second thing that is kinda weird about it is that they go to great lengths in the directions to tell you not to get any water in the unit and that it can damage the unit.. and that “they can tell if you do” or something to that effect. I haven’t been able to figure out of that means that the mouthpiece should be 100% dry or not, but I usually just shake it off thoroughly to remove any excess water and the unit still seems to work fine. The third thing I’ll mention is that something like one out every fifteen or so times, I’ll hit the button to start disinfecting and the little green LED will turn on but the blue UV light won’t until much later. Then the next time I hit the button, it seems to work fine and the blue light comes on in a few seconds. I’m not sure what that’s all about, but I usually just run it through another 3 minute cycle. The page on the Sport’s Authority website has the following description for the product info…. There was even one review on the site that gave the product 5 stars and mentioned that it took away any bad taste or smell. Later on I found the manufacture’s website which confirmed that it would indeed within 3 minutes kill Strep, E. coli, Staph and other harmful bacteria. I’m pretty excited for the product to arrive. I like the idea that it is battery powered, which I can easily take with me on vacations and camping without having to worry about finding an outlet or drag along a power cord. Once I have my product, I’ll plan to record and post my own unbiased review. I had been doing some reading online and ran across a post from a gal who was talking about her boyfriend and his snoring issue. The post focused on how he’d had his tonsils and adenoids removed, apparently due to numerous bacterial infections, but how it didn’t make any difference with his snoring. It reminded me that I had failed to mention in my contributing factors posting that I also had my tonsils removed as a child. Ironically having them removed hasn’t seemed to help prevent any of my snoring as I aged. Wikipedia reports that extra tissue around the soft palette often contributes to snoring and is sometimes removed in surgical procedures to help eliminate the snoring. Here’s a picture of some of these parts in the back of the throat. I can’t imagine how the uvula would actually make any difference with snoring just because it appears to hang there and not really touch anything. 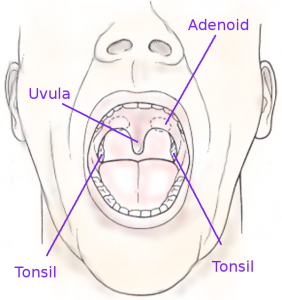 All these parts, the uvula, tonsils and adenoids (which are not typically visible) can restrict airflow and potentially contribute to snoring. I have to wonder if maybe my adenoids play any role in my snoring or not… for now the mouthpiece is working great though, so I won’t dwell on it too long! Today I ran across an article on the WebMD site that gave some tips to help stop snoring. 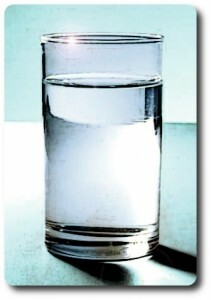 The last tip, one that I hadn’t encountered yet, recommended keeping yourself well-hydrated. Daniel P. Slaughter, MD, is quoted in the article as saying “Secretions in your nose and soft palate become stickier when you’re dehydrated,” and continues to say that “this can create more snoring.” This interested me greatly as I believe I am most often in a state of slight dehydration. I believe this is the case as my urine is often darker than it probably should be, I rarely drink water in-between meals, and even during meals, I may have either coffee, milk or a soda-pop rather than just drink water. To make matters worse, I tend to sweat easily when I am working, even if the task isn’t very physical. Living in the South, where the humidity is high, any workout really makes me drenched in perspiration and it is difficult keeping up with the hydration. As I mentioned in some of earlier posts and pages, I also tend to have a lot of mucous in my nasal passages. I can see where this may be a factor. Luckily, lately I have successfully reduced my mucous through modifying my diet and other means, but I plan to increase the level of hydration anyway to see if this may help. 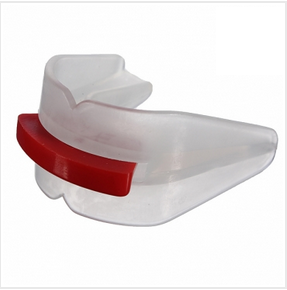 If I notice a difference in the ability to breathe easily I may even try a few nights without the anti-snoring mouthpiece even though it has worked very well thus far. My main concern regarding keeping myself well-hydrated is that I will cause myself to actually lose sleep by having to wake up to empty my bladder. This may be counter-productive in the end. Occasionally, I do end up getting up in the “wee” hours (pun intended) of the morning to use the bathroom and at least half of the time I have trouble going back to sleep. Getting older seems to be fraught with different health challenges. It makes me wonder, however did our previous generations even cope?! 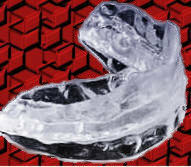 I figured I’d share a few tips on what I am doing to maintain the mouthpiece I am using to stop my snoring. Believe it or not, I really don’t think it is really very healthy to pop it in my mouth every night without at least a little TLC. What I do isn’t really a lot of work, but I do think it makes a difference. The main thing I religiously do before and after using it is always rinse it off. I don’t use extremely hot or cold water, just a mildly warm temperature. I think if the water is too hot, it may have the chance of deforming it slightly and we want to keep it in a shape that holds the lower jaw forward the best. In fact, one or two days I was in a big rush and I noticed that if I did not rinse it off immediately after use in the morning, it had a funky smell. My guess is that this is due to the natural bacterias in the saliva in your mouth… and it would smell a bit even if after just a few hours. The other thing I try to do at least ever other or every third day is to spread toothpaste over the entire mouthpiece, especially in the area where the embedded teethmarks are. I try to rub it thoroughly into all the crevices and then use a toothbrush to scrub it with the toothbrush. Then I rinse all the toothpaste off. I have found that after it is rinsed off there is no longer a slickness to the mouthpiece but has a nice clean “grippy” feel. Best of all, the mouthpiece still has a pleasing minty flavor to it! Oddly enough I almost look forward to putting it in for the night. During the day, I do place the mouthpiece in the plastic container which it came with when it was shipped to me. I don’t close the container on it fully though and I leave it open partially in order to allow the air to circulate around it better and dry more quickly. I am not sure about the amount of bacteria toothpaste can kill, so I also have been performing a little rinse with mouthwash over it so the alcohol can kill off any baddie bacteria that just may be hanging around. Some brands like Listerine seem to have their flavor linger a few days longer than I would expect, so maybe it is getting slightly absorbed by the silicon/plastic-like material that the mouthpiece is made from. In my earlier Internet research for finding ways of curbing my snoring and finding better sleep, I ran across a few different sites, many which were “natural remedy” sites trying to push supplements and herbal type remedies. Being fairly skeptical, I tend to put little credence in the results that they promise. However, one site called the Accidental Scientist’s blog did catch my eye, mainly because of the non-chalant way that was described about the results and how different friends corroborated his fish oil method for temporarily overcoming snoring… not to mention the fact that he wasn’t selling anything on his site. I finally got around to trying this fish oil (Omega-3) supplement to see if it would make any difference. I can emphatically say that it didn’t make any difference for me with my snoring. I couldn’t believe how large the gel capsules were and how much trouble I had swallowing them. This made me wonder whether I may have a less room in the back of my throat compared to most people.. and if I do have less room, maybe the soft palate area is more susceptible to snoring! I did notice another effect from the fish oil and that was it seemed to cause indigestion and a bit of acidic reflux. I’ve noticed that whenever I have acidic reflux in my throat it would irritate my throat and also make my snoring worse! Apparently there’s some recent research out there that indicates that 44% of people with acid reflux also snore which I read about here. What’s also interesting is that back in the 40’s there were some cases that were a lot like the “Injection Snoreplasty” procedure where the upper palate is injected with a stiffener that produces scar tissue. The scar tissue helps prevent the vibration that causes snoring. The cases back then involved injecting fish oil of all things! Apparently this was somewhat painful. Even though modern Injection Snoreplasty is an outpatient procedure that usually only needs a local anesthesia, some people have reported it was more painful than was expected and needs to be repeated over time to remain effective. Being pain averse, I’ll probably save that as a last resort! I also read in a lot of different sites where Melatonin would help with sleep. 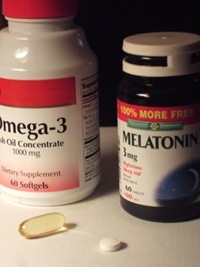 Melatonin really doesn’t have much to do with snoring or helping to prevent sleep apnea or anything like that. Rather, it is supposed to help you with being “mentally at peace” and improving the “quality” of your sleep. Due to my work, I get fairly stressed out and wake up in the middle of the night and have trouble falling back asleep due to my brain hashing over troublesome projects I’m dealing with. I don’t think it provided me with much if any benefit from taking the melatonin, or at least if it did help, it wasn’t really enough for me to take notice. I’m planning on keeping my eyes open for other things that may help. The mouthpiece that helps prevent my snoring right now is good, but if I can find something else that is easier I’m all ears and it definitely never hurts to try!